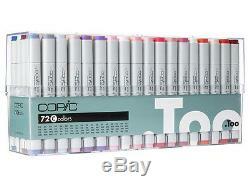 COPIC 72pc Classic Set C Alcohol Markers C72C Too Anime Artist Comic Color. You are purchasing Copic 72pc Classic Set C. Packaged in a clear plastic case, a Classic set is the ideal way to begin or add to a marker collection. This set contains the following colors: B18, B21, B24, B41, B45, E00, E02, E21, E35, E39, E41, E43, E51, E53, E55, E57, E59, E77, G00, G05, G09, G12, G14, G19, G20, G24, G40, G82, G85, BG11, BG32, BG34, BG45, BG49, B12, B16, R59, YR02, YR16, YR21, Y08, Y19, Y23, Y38, YG05, YG07, YG09, YG11, YG21, YG25, YG41, YG45, YG63, YG67, BV04, BV23, BV31, V12, V15, V17, RV02, RV10, RV13, RV21, RV25, RV32, RV34, R00, R05, R11, R24, R39. If you have any questions, please ask BEFORE purchasing! We strive to provide excellent customer service! Please help us to keep our prices low!!! The item "COPIC 72pc Classic Set C Alcohol Markers C72C Too Anime Artist Comic Color" is in sale since Tuesday, August 01, 2017. This item is in the category "Crafts\Art Supplies\Drawing & Lettering Supplies\Art Pens & Markers". The seller is "jenstuff2go" and is located in Middleburg, Florida.